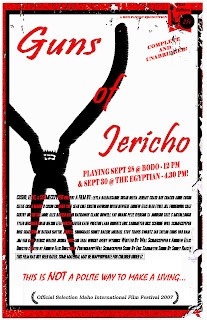 Sunday, September 30th at 4.30 at The Egyptian Theater. Both screenings will play with Drew Wattles' short film "Miller Time", based on one of my scripts as well. Go figure. Honestly, I'm suprised to see us playing at the Egyptian; that's a big theater usually reserved for "big name" films in the festival. Apparently the directors of I2F2 think the movie's strong enough to have a full house. And, by cracky, it just might be. After all, it's all about the pliers, baby. 2005 - Nada. Nothing. Zilch. So, I suppose it's time that we got back into the festival with a gun-slinging comedy. Yay for us. ... but more on that later.